I have made so many desserts recently and I feel like only a few of them have been, "Wow!" desserts. Last week I made homemade Samoas bars and I was disappointed in their texture and flavor, especially for the amount of work bar desserts often require. These bars, however, did not disappoint, the coconut layer melts in your mouth and I love the nostalgia of making your favorite candy into a bar. These don't have too many steps either. The crust only has 4 ingredients and you just mix them together. Then press the crust mixture into the pan and bake for around 8 minutes. sweetened condensed milk and vanilla. Press into pan and then bake again. While that layer is baking, melt your chocolate and have it ready. Pour the chocolate layer over the coconut layer. Add your chopped or whole almonds, if desired. 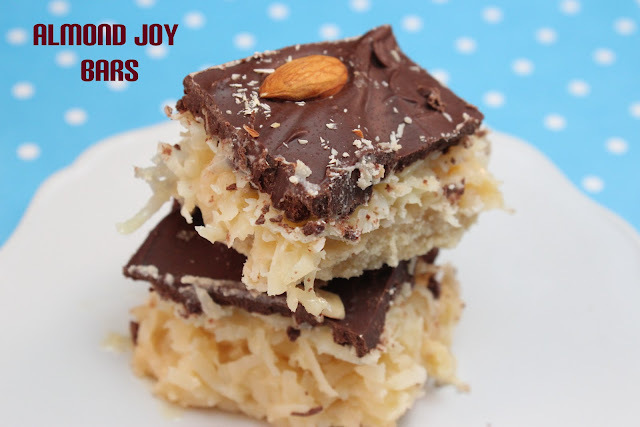 Refrigerate, cut into bars and enjoy! Preheat oven to 350. Line an 8 x 8 pan with foil and coat with cooking spray. In a small bowl, cream butter and brown sugar until combined, then add the flour and salt. 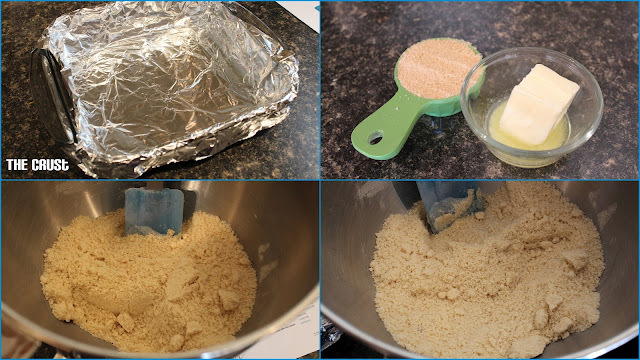 Carefully mix until it resembles chunky bread crumbs. Transfer into the prepared pan and evenly press the batter into an even layer. Bake for 8 minutes. Cool on a wire rack while preparing the coconut topping. 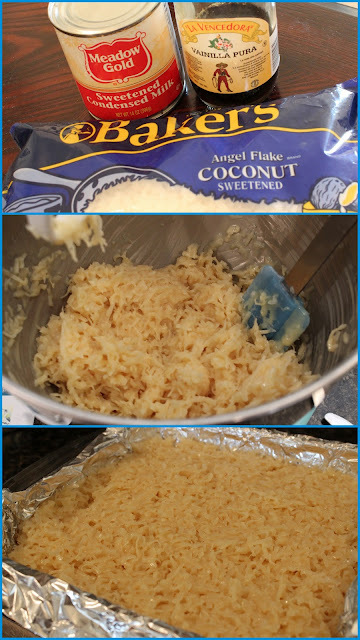 In a large bowl, combined the condensed milk, vanilla and coconut. Spread over the crust and bake for 20 minutes until it begins to brown slightly. Melt the chocolate over a double boiler (or microwave if you prefer). [ I used a combination of dark and semisweet chocolate to create a "bittersweet", feel free to use whatever chocolate combination you have on hand but I recommend NOT using milk chocolate as it isn't rich enough.] Pour the melted chocolate over the coconut layer and spread into an even layer. If desired, toast your almonds on a cookie sheet for 3-4 minutes. Then top chocolate layer, while still hot with whole or chopped almonds, I did some whole and some chopped to make it look more like an "Almond Joy." Allow to cool then refrigerate until hardened at least 1.5 hours.